The Stack Panel appears in the bottom left-hand panel, and is only visible when the Show I2L check box is enabled. The Stack Panel shows the state of the I2L stack. The top of the stack is represented by the first item in the list. The top item is the most recent item added (pushed) to the stack. The stack contains subroutine return addresses, arguments and other types of data. The values are displayed as decimal and hexadecimal numbers. The Stack Depth display at the bottom of the panel shows the number of items on the stack. 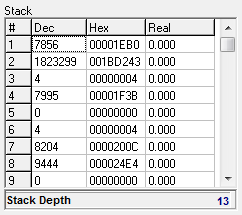 This is different than the Stack Dump option, which only shows the subroutines on the stack and also translates the addresses into subroutine names.